As human fossil fuel emissions force the world to warm, moisture and precipitation levels are changing. Wet areas become wetter. Dry areas become drier. Spring and Summer temperatures increase. And earlier spring snow-melt causes soils to remain drier for longer periods, increasing incidents of drought while lengthening the wildfire season. These hot, dry conditions also increase the likelihood that, once wildfires are started by lightning strikes or human error, they will become more intense, larger and long-burning (paraphrase of this Union of Concerned Scientists Report). An extreme heatwave and drought in East Asia is now sparking extraordinarily large wildfires in the Amur region of Russia just across the border with China. The massive fires are plainly visible in the LANCE-MODIS satellite shot and include at least four contiguous fire zones. The fires each show very large burn scars with fire-fronts ranging from 10 to 40 miles across. A very large smoke plume cast off from these blazes is now visible in the MODIS satellite shot. It stretches away from the massive burn scars and on out into the Sea of Japan nearly 1,000 miles away. By comparison, smoke plume analysis hints that the Amur fires together now seem to dwarf the recent massive blaze that burned 2,400 structures in the Canadian town of Fort McMurray over the past week. Yet another instance of extraordinarily large fires burning in a world forced to warm by human fossil fuel emissions. Thankfully, the Amur fires aren’t currently raging near any large settlements. So it is less likely that widespread loss of life or property has occurred as a result. International news media had no reports on the blazes (as of Tuesday), so little information is now available other than what can be discerned by NASA satellite map analysis. In context, these fires ignited along a ridge zone that has featured extremely warm and dry temperatures. 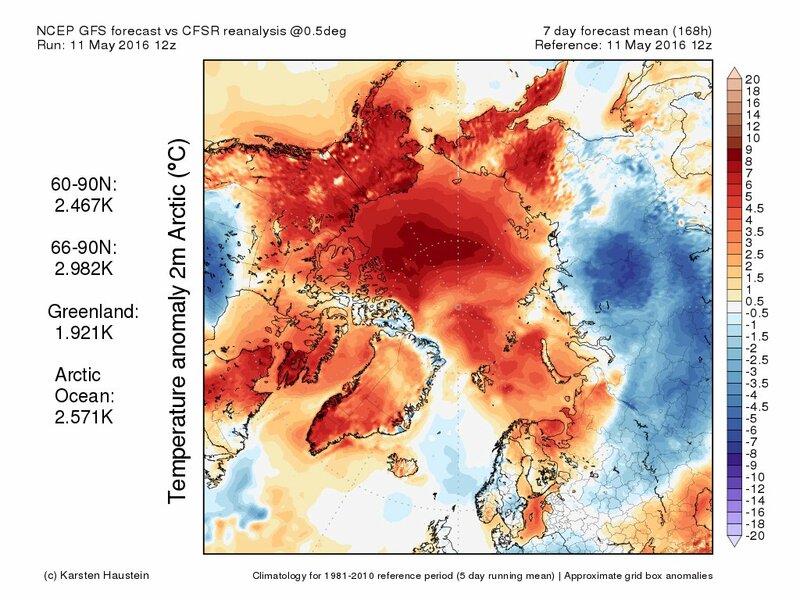 Rising off a heatwave that began in Southeast Asia, these warm airs are now expanding northward toward the Arctic and will, over the current week, contribute to an amazingly potent heatwave building over the rapidly thawing regions of our world. Ridge development in this zone has been quite persistent and we can expect continued large fires creeping north toward the Arctic. This extremely hot and dry zone has also lit off numerous fires in the Lake Baikal region. Representing the furthest southern extent of the Northeast Asian permafrost zone, heat and thaw in the region due to global warming have resulted in increasing fire hazards. As with Northwest Canada, an unholy relationship exists between fires and thawing permafrost. The permafrost as it thaws and dries provides an understory fuel that aids in fire persistence and intensity — sometimes resulting in hotspots that smolder throughout the winter. And the fires can activate more and more of the permafrost layer below — pumping out additional carbon which can worsen the warming trend which ignited the fires in the first place. For 2016, warm, dry ridge zones have tended to dominate both Western North America and Eastern Asia. And in a world that since the start of 2016 has been nearly 1.5 C above 1880s averages, we have seen a very intense early start to fire season featuring numerous very large fires in these zones. As May progresses into June, risks for even more intense fires increase even as the fire zone advances with the warm airs heading north toward the Arctic. The times notes that 11 structures have burned and more than 50 villagers have been evacuated. In total, more than 2,100 personnel are now involved in firefighting efforts in Amur, near the Trans-Baikal region, and in Buryatia. Russian officials note that some of these fires were ignited when locals burned grass to clear fields for farming. A tradition among Russians, the fire danger is now so intense due to changing conditions brought on by climate change, that officials have outlawed the practice. Resulting wildfires have, over recent years, consumed massive resources. So it’s understandable why Russian authorities are keen to reduce wildfire ignition sources. That said, it is likely such laws are not enough to prevent the fires — which could also be ignited by lightning from more prevalent storm systems or by smoldering peat bogs which have become more and more involved in permafrost zone fire hazard increases during recent years. Just read this. Joe is, sadly, a little behind the curve on what kind of global temperature increases are locked in. Even if we go to zero now, we probably hit 2 C or close to it (and it could be worse if the global carbon response to the current forcing is strong). However, he’s absolutely right about the policy train heading onward with increasing speed and the fact that rapid renewable deployment is absolutely necessary. That said, the fact that CFR is pushing for more R&D and against deployment is disturbing to me. Shows that global policy agency has still got its horse hitched to fossil fuels. Basically anyone against rapid deployment now is giving the fossil fuel industry carte Blanche for continued burning for years and decades. I think we need to start looking at deployment of rebel-ware. Or renewable energy systems that are more modular and less pricy. For example, solar blankets that hook up to battery packs with outlets capable of running appliances such as refrigerators, washing machines, and space heaters as well as TVs, computers, cell phones, and other appliances. Heck, I’m surprised someone hasn’t come up with an unfolding solar tarp that could be used to charge an EV at any location. The idea for rebel ware would be to make energy generation and storage both portable and ubiquitous — as a best way to circumvent fixed, politically, and monetarily tied special interest infrastructure. Re rebel ware—a few weeks ago, I caught the end of a discussion on TV about green energy in which one of the panellists was talking cell phones. She pointed out the speed–a couple of decades, tops—with which cell phones have transformed how we communicate, to the point that people are now disconnecting landlines (if they even get them in the first place). New technology drives out the old, she said, adding with a smile that what has just happened with communication—making it portable and personal—is about to happen with energy generation. 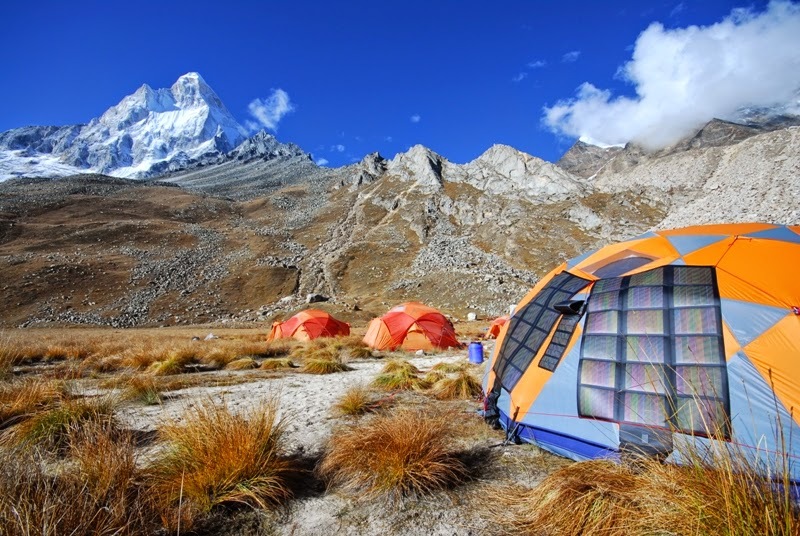 So yeah, that solar charging tarp…. Yes. But set up and marketed in a manner that condo and apartment dwellers could set up on their terraces to charge battery packs for refrigerators and appliances. Solar covers for EVs. Solar covered gazebos for the back yard. Solar covered awnings. Solar covered curtains and drapes. Small, scalable, affordable, ubiquitous. So deploying rooftop solar where there’s no resistance is great. And with renewables so low in price, some utilities will be jumping in as well. But in places like Nevada, North Carolina, Florida, or Virginia where utilities cling to fossil fuel legacy assets, you need something that can get around the traditional barriers to deployment. With thin film so inexpensive to produce these days, I think there’s an opportunity to get these things to market at less than 3 dollars per watt for the buyer. Longer term, with economies of scale, it could go below 2 or 1 dollar per watt. You don’t need racking. You just need a material to print the cells onto and battery storage. Clearly not widely available now at affordable prices. But something solar retailers should be looking at if they want a product that gets around the traditional hurdles. I would expect the opportunities to be pretty great for places that are already off-grid but don’t have strong roof structures to support traditional roof mounting or where more spatial deployment flexibility is needed. Lets be realistic Robert… going to zero now is not going to happen. Going to Zero won’t happen any earlier than 2025 imo. … and by Zero I mean the Keeling curve going downwards as Zero emissions are practically impossible. Chile’s southern coast has been hit by the biggest ever “red tide” in history. It’s caused by toxic algae which is killing sea life and damaging the local fishing economy. Well, we passed the 400 ppm atmospheric average last year. This year there’s good odds that we will not see any one month below 400 ppm in the Mauna Loa average. After 2016, we will never see 400 ppm again without anything other than a miraculous change of heart among nations, a sudden halt to fossil fuel burning, a heroic effort in land management, a huge helping of amazing luck when it comes to carbon feedbacks, and some massive deployment of carbon absorbing materials. So yeah, unless we really change things now and we are very, very lucky, it’s by-by 400 ppm for our lifetime and for scores to hundreds to thousands of lifetimes to come. We’ve basically set the Earth on a path toward a rapid transition to another geological era. And the way we are doing it is unprecedented in all of the history of nature. Everyone in this country needs to internalize exactly this, exactly as you said it. Are you referring to Australia’s very own minister against the environment? and what utter failure of his are you asking about? there are so many it is even hard for us living in Australia to keep up!! So true Abel, by fallen one are you referring to Abbott? The failures of Hunt are just breathtaking, whether it be approvals for new coal mining whilst pretending to care about the reef, the constant staggering claims of protecting the reef by cleaning up run off water when it is sea temperature and acidity causing its demise, or his constant BS trying to portray our pathetic emissions target as something to be proud of ??????? Unfortunately though, it is the general populace causing the issue, our collective failure to demand that our media ask the right questions, that our leaders are held to account is enabling this green washing to occur. Matt, with Harper gone, (although Trudeau is a rolled gold phony and will reveal himself as such) Australia may be the most retrograde nation on Earth. Hunt’s blatherings, lies and humbug mostly, re. the Reef catastrophe have been utterly despicable. When you see him speak, his human fraudulence and inauthenticity SCREAM at you, and the fate of humanity is sealed as long as this type is in power. Fair description! However in reality, the opposition’s “minister for environment” when in office has been no better! 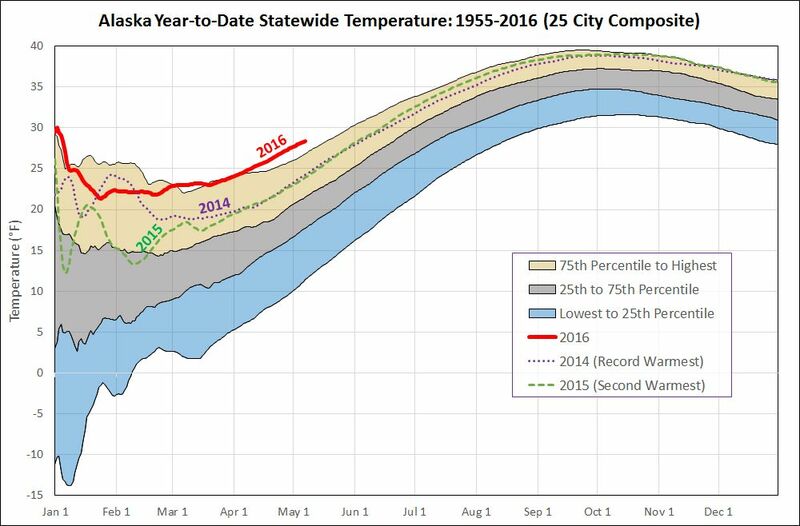 @ZLabe A large proportion of that area had their warmest Jan-Apr on record (red on map). That’s a good graph, DT. 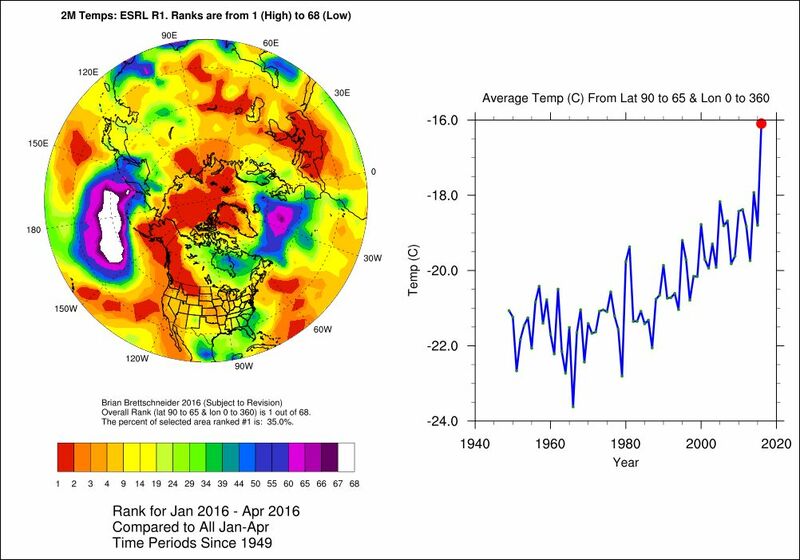 We’ve effectively just had one decade of Arctic warming in just one year. For all intents and purposes from the point of view of Arctic climate research and expectations of sea ice loss, we are now where we thought we would be in the 2020s. This year is going to be rough. A view of the top of the world with many hot spots. – United Arab Emirates – localized geo-engineering? The United Arab Emirates is certainly no stranger to ambitious mega-projects. Just take a look at the towering Burj Khalifa, the tallest building in the world, or the Palm Jumeirah, the artificial archipelago in the shape of a palm tree that juts out into the sea near Dubai. Even by the UAE’s standards, however, building a mountain would stand out as an ambitious plan. And perhaps what’s so remarkable about this plan is that despite its audacity, it would serve a sadly utilitarian purpose: to bring rain. I guess you have to be pretty desperate for water if you’re considering building a mountain to make it rain. But, yeah, here comes the geo-engineering. It gives the uninformed reader the impression that the forests of the world are fine, and are expanding in territory. If wildfires were the only threat, then maybe that would be the case. If you include deforestation for agriculture/lumber production, beetle infestations, fire and climate change, the it becomes clear the forests of the world are in dire straights. That ppg caught my eye as well, Ryan. Even if the boreal forest is still a net sink, if it was a larger sink in the past then overall the effect is that it is adding to the atmospheric CO2 overburden. An existing sink does not have to become a source to still be a failing sink. Nailed it. It’s basically misleading information. If you add deforestation by human beings into the equation along with destruction by increasing wildfires, then the net effect is that forests are losing their ability to draw down carbon. This is especially true when you consider the peat forests of Indonesia and the now imperiled Amazon Rainforest. Climate change is melting glaciers, reducing sea-ice cover and increasing wildlife activity — with some of the most dramatic impacts occurring in the northern high latitudes. New research projects an increased probability of fires occurring in Alaskan boreal forest and tundra under a warmer, drier climate. Thanks R.S you really keep us on track with the latest events in the age of the new normal – can it get more desperate ?. As for the Dubai mountain, sounds like a case of “more money than sense” to me, having lived in a neighboring Emirate for around 15 years, where if it rained one day a year it was a blessing. Better invest the money in carbon free desalination plants. However in fairness we have seen other countries remove table tops in the quest for coal (which is even worse). The Conversation (U.K) has a good article about Dubai’s folly today . . .
“Could the UAE build such a mountain? The technical challenges would be daunting and the economic case may not stack up, but the key questions are around social acceptability. Do they have the right to so radically alter the landscape, or can such action be justified if that is what it takes to supply water to a parched land? 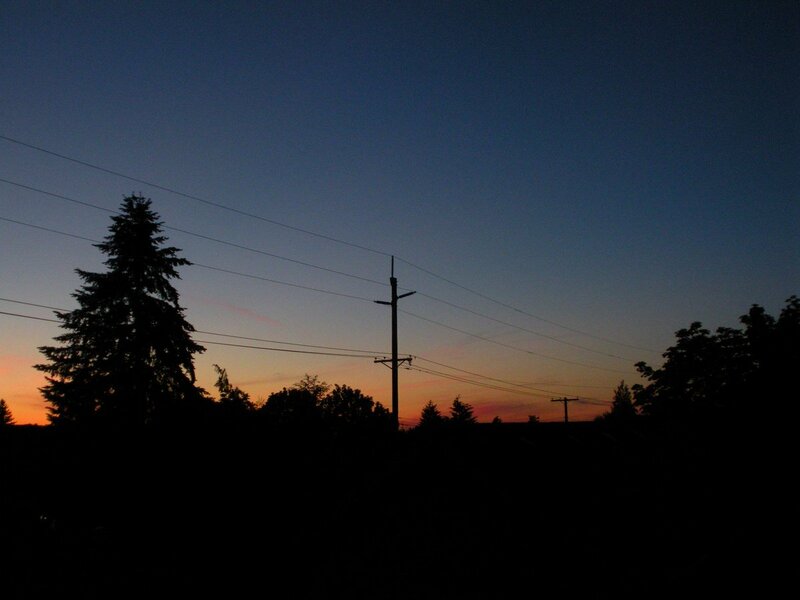 Dusk, Portland, OR — W NW horizon, smoke sky likely from wildfires NE China. May10, 2016. “I understand that CSIRO is undertaking a major restructuring that may lead to the closure of AeroSpan [CSIRO’s partner program],” Dr Holben wrote in the letter addressed to Alex Wonhas, a senior CSIRO executive, and dated May 1, 2016. “The purpose of this letter is to express my dismay about this, on behalf of NASA and the global aerosol community,” he said. Understanding aerosols – the distribution and character of airborne particles and clouds – “represent the single greatest source of uncertainty in climate simulations”, Dr Holben said. CSIRO’s contribution has largely been to help calibrate and validate satellite readings that cannot easily distinguish between different types of aerosols. These range from dust and industrial pollutants to sea salt. So we should be very clear where the blame for this lies. It rests at the feet of the anti-science extremists, better known as climate change deniers, who now occupy the halls of political power in Australia. A dangerous and globally pervasive political ideology constructed solely to prevent new energy sources from displacing fossil fuels. One that is corrupting to political systems everywhere and one that is now in the process of enforcing a global mass extinction and human civilization collapse combined. Well, then the Gods should be destroying the fossil fuel investors CEOs and leaving the rest of the world be. Murdoch, the Kochs, Exxon Mobile, Suncor, Shell, Buffet, Peabody, people like that. Maybe they are mad. Trump sure seems to be. But the problem is that there’s a pretty clear and malicious method to it all. Well they’re certainly making certain stripes of Christians absolutely barking mad, that’s for sure. Always screeching about abortion and homosexuality and not a word about taking care of each other or of Mother Earth. And they also worship Mammon! They’re a false church unto themselves. Buffet’s actions in Nevada are an example of this. And these actions had serious and severe negative impacts on the US solar industry that are now playing out in the markets. When he did was effectively remove one major avenue for growth for solar. One market whose prevalence of direct sunshine provided the best economics for solar in the country. This hit the 3rd party installers hard. And if you look at the 3rd party installers, they are now expected to put out 4-6 gigawatts of rooftop solar at residences and businesses this year alone. That’s nearly as much as what utilities are expected to install this year. And it’s an avenue of growth that is not subject to the whim of utility boards who have a vested interest in defending legacy fossil fuel assets. That’s why continuing net metering policy is so important right now. It’s not really a question of if the solar industry could survive without it. It’s a question of how fast we can drive the energy transition and keep as much fossil fuels as possible in the ground. The faster we deploy wind, solar and EVs, the less carbon gets unearthed and burned. So we need to do everything we can to support that. Ugly, considering that once the aerosols all fall out, we get a global average temperature spike of anywhere from 0.4 to 2.5 degreed Celsius. Sorry. That’s incorrect. We get 0.2 to 0.4 C if the aerosols fall out. 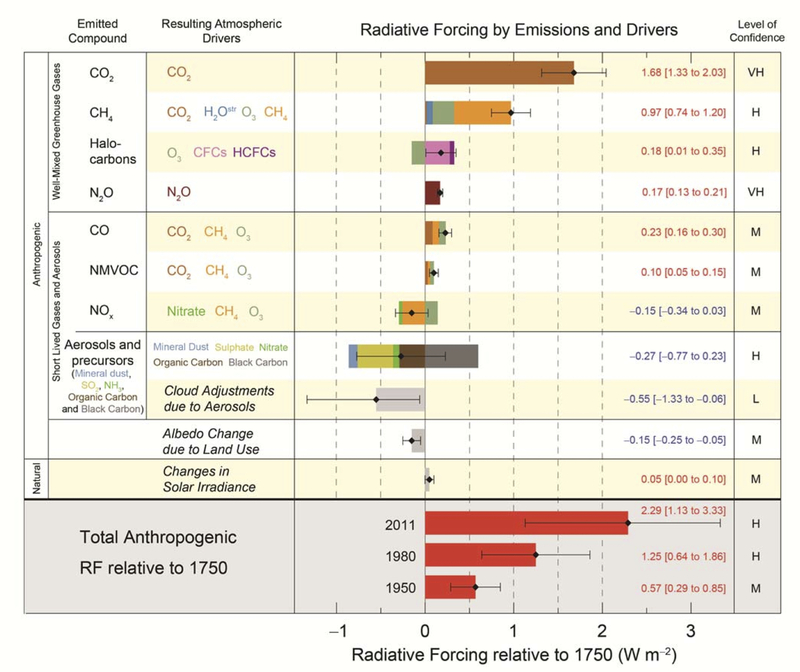 Aerosol negative forcing is nowhere near an RF of negative 2.5 C.
The other point is that when we stop burning FF, we get methane from the human sources rapidly falling. So that mitigates the aerosol spike somewhat. Abel it is just like Canada under Harper, Abbott’s dead-soul mate, where they simply destroyed the scientific base and evidence, as if that would make reality disappear. These people are our enemies, they are the enemies of ALL humanity, past, present and future, and they must be defeated, one way or another, or we are history. And they are insanely fanatical as only Rightwing psychopaths can be. The transition from Abbott to Turnbull made NO difference. Initial on-site estimates showed that early atmosphere was lightweight – a finding supported by more detailed x-ray scans from different lava flows. The bubbles showed that early atmospheric pressure was less than 50 percent of what the Earth has today. The findings of their study complemented Buick’s earlier finding that Earth’s microbes were taking in most of the atmosphere’s nitrogen. Researchers believe that this lighter atmosphere have several climate implications. The team already uncovered some evidence that suggests presence of liquid water. This means that the ancient atmosphere had many greenhouse gases like carbon dioxide and methane, and only small amounts of nitrogen. “We are 95 percent sure that the pressure was between 0 and 0.5 atmospheres,” said Blue Marble Space CEO and lead author Sanjoy Som. The finding represents information about the pressure at Mount Everest’s elevation of 5,500 meters (3.4 miles). The layers of the stromatolite which the team studied also showed evidence of single-celled microbes that have thrived despite the early Earth’s thin atmosphere. Quite likely. The term auxiliary greenhouse gas is more than appropriate. If methane levels remained high due to numerous sources, then the effect would be quite strong and may have been greater than overall CO2 at the time. Pretty interesting information. I’m always fascinated by the data about the past scientists are able to tease out of the modern world, through various ingenious techniques, each more sophisticated and clever than the last. Yes, really interesting, thanks Abel. Methane is also a strong reducing agent, a throwback to the reducing atmosphere of long ago. it’s almost like a fight between our modern oxygenated atmosphere and the ancient reducing atmosphere. Oxidation of methane is capable of exhausting the oxidation capability of the hydroxyl radical in the atmosphere, increasing methane lifetime. In the oceans, oxidation of methane makes the oceans more acidic and hypoxic, reducing oxygen levels. We’re just at the first tiny stages of methane release, if we keep forcing temperature increases. We might fix the global warming problem before we get to the later stages. Methane releases so far have had little effect on the lifetime of methane in the atmosphere, and it’s unclear how much impact methane release is having on the oceans – probably not much, at least yet. We’ve got a long way to go, but we need to stop – while we still can. At a rough estimate, the fire will have resulted in a few million tonnes of CO2 emitted. That compares to Alberta’s 274m tonnes in 2014 — the majority of which is from tar sands production. CO2 emissions from the fire are not expected to be significant on a global scale “unless a lot of peat burned,” said Dr Mike Flannigan, professor of renewable resources at the University of Alberta. “We will have some rough estimates in a week or two,” Flannigan told the Guardian. The scale is daunting. In 2011 a similar forest fire destroyed 400 buildings in the town of Slave Lake, Alberta. Ash clogged water treatment and sewer systems. Without electricity for two weeks, more than 4,000 freezers and refrigerators with rotting food had to be disposed of, along with debris cleaned from the streets, and waste from homes, buildings and yards, including fire-damaged concrete from foundations and walkways, vehicles, swing sets and more. One large fire of this kind doesn’t tend to be significant on a global scale. But the peat burning and permafrost thaw adds up. Also, when you consider the fact that during a fire season we now have numerous very large fires burning in the Arctic, then the overall wildfire trend does become an issue. And not just with CO2 — these fires produce methane emissions hotspots as well. The Administrative Law Judge concludes that Peabody Energy has failed to demonstrate, by a preponderance of the evidence, that climate change is not occurring or, to the extent climate change is occurring, the warming and increased CO2 in the Earth’s atmosphere are beneficial. On nearly every key point the judge ruled that the “preponderance of evidence” was on the side of the environmental groups and not the coal company, and recommended that the State of Minnesota use the federal social cost of carbon estimates. Coal’s climate contrarians took their best shot at climate science, and they lost. I love hearing that. In the media world the deniers have oversized influence and power, and create their own facts by simply denying objective reality and making assertions that can’t be backed up with evidence. But in court, where provable facts are the only evidence considered, they deniers have no chance. It’s nice to see them thoroughly rejected. The big FF companies are getting the message. They know where the money will be heading forward and they are starting to buy in. I don’t know that the word “unexpectedly” fits. I’ve been waiting for this to happen, as corporations generally have one agenda – making money. Still, it’s a good sign to see – Finally. I wouldn’t necessarily read this as good news. Exxon threw a few pennies at biofuels and look what good it did to that industry — an industry Exxon attacked in media, helped fund papers that misinformed people about biofuels energy return on energy invested and, sometimes, carbon emissions, and spent lobbying money to block in state and federal legislative bodies. My experience with Exxon, at least, is that investments in renewables has been more aimed at manipulating the renewable energy markets to their advantage — in other words, giving them a lever to open up a chute under competitors and to drop them out of the market. Total is another matter (and possible exception to the broader industry rule that applies to Exxon) and seems pretty serious about diversification. I can’t really comment on Enbridge because I don’t yet know enough about that company’s behavior. But throwing small change into a competitor’s industry is not a sign that oil companies have seen the light on renewables, so to speak. It’s more likely that it’s part of some broader strategy for retaining market dominance for the purpose of selling legacy fossil fuels and extending the lifespan of legacy fossil fuel infrastructure. “Still, the investments are tiny by petroleum industry standards. Even Total’s $1.1 billion deal to buy Saft — a record for the storage industry — represents a tiny fraction of the oil giant’s $120 billion market value. Thanks for the clarification. I know that Exxon, the Koch’s and other FF “players” are the devil incarnate. Still, if I were an executive at one of these corporations I would be reading the handwriting on the wall and be trying to find a way out of the resources cul-de-sac in which they now reside. Perhaps not until after the next election, but in the near future, events will be dictating what happens. I still dream of a fairly serious carbon tax. If you have been watching Saudi Arabia, you will see a dawning awareness that oil is not the future and a plan to diversify. Do not think I am supporting the sheiks here. But, they also are in this bind as the world moves closer to going CO2 free, as the only realistic course. A smart economic play would be to make small consistent investments, so as to avoid the impression of a panic or a serious move, thus keeping the cost of the companies acquired reasonable. One last thing: I am not a fan of large corporations seizing alternative energy and creating the same centralized and controlled system we now have with oil. I a Musk fanboy. Give me solar panels and efficient batteries and set me free. The execs have proven again and again that all they really look at is the monetary value of fossil fuel reserves and at strategies involved in both getting those reserves out of the ground and to market so that planned profits can be realized. They are hypnotized by a pile of black gold that they have the technical means to dominate and the monetary and influential means to force people to consume and use. Maybe they are starting to give up this ugly dominance game. But a little money thrown in the direction of renewables at this time is, to my mind, no sign that this is really happening in any meaningful way. Five years after a mysterious and sometimes fatal disease struck Arctic Alaska ringed seals, causing them to lose their fur or develop bleeding lesions, there are signs of the disorder or something similar to it among a different species of ice-dwelling seals. Federal scientists who just completed a survey of ice seals in the Bering Sea found several ribbon seals with bald patches, including one that was almost completely bald. Indeed. You add iron and it’s just food for the hydrogen sulfide producing bacteria we don’t want arising in the world’s waters. Although I can’t find a link – I did hear on NPR yesterday that the Army Corp if Engineers has turned down the request for the establishment of a new coal exporting facility in the Pacific NW. One more nail in the coal coffin. Yea! I think we need a similar grass roots effort in Nevada to bring back solar incentives and get those politicians whom Buffet stacked into the system to protect legacy coal and gas out. The fire in Fort McMurray seems the script of some Earth-seeks-revenge horror movie. As I have mulled my climate blogging ennui for the past couple of weeks, I decided, last night, that I am about to have one of my climate-change transitions. Perhaps I am getting to the age of memoir. Even read a lot of the literature from the past year on the psychological state of the climate scientist. The transition: A couple of blogs ago I recapped a series of papers from 2014 that made a compelling case that we were committed to significant melting of West Antarctic glaciers. When I read those papers in 2014, my first reaction was one of calming and clarity. Certainty had been defined. My last climate-change transition came in 2011, when I felt I was teaching this impossible and incorrect mantra of avoiding dangerous warming. There was no evidence that we would avoid two degrees (C) of warming (global average surface temperature), and there was significant evidence that two degrees of warming was, in fact, dangerous to some, if not many. I went into the camp of those saying that four-degrees was more realistic. Two degrees would require us to remove carbon dioxide from the atmosphere, a capability that I think we need to make happen. Good for Ricky. And, yes, long-term, given to total greenhouse gas load, we are looking at close to 4 C.
Current loads, I assume… whish is now between 485 and 500 ppm of CO2e. Current CO2e is near 490 ppm. Not news to the scribblers, but glad to see the coverage. 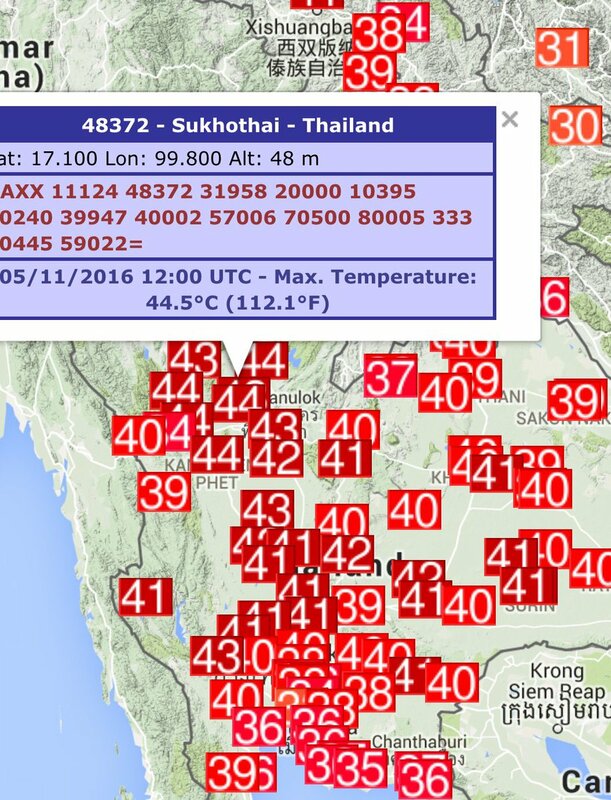 All-time record high temp for any month in Thailand tied today in Sukhothai. Previous 44.5 on 4/27/60 in Uttaradit. Fri will be hot in PDX 90+ F.
I, like Dahr, share a deep sense of personal anguish for what’s happening to both the innocent creatures of our world and to the many human beings who did nothing to construct a fossil fuel energy infrastructure that is now malicious to life here on Earth. What we’ve already locked in will be terrible. The fight we’re in now is to make the situation possibly survivable. Anyone supporting legacy fossil fuel assets or invested in the fossil fuel industry now is part of the problem. Anyone supporting the current republican party platform or other fossil fuel aligned political forces is part of the problem. And many of us, as captive consumers, have basically been forced by political and economic dominance by fossil fuels to be part of the problem. We’re trapped by an ugly and murderous system and we desperately need a way out. I try to tone down the words in the blog and in comments so that the forum is accessible to as many people as possible — people who have not been given the right information and who are in many ways innocent due to a kind of inflicted ignorance. But the anguish I feel is a raging thing and the urgency for immediate action burns in my breast like an unstoppable fire. How could we just sit idly by and let this happen?? We must act. We all must act. The time is now. I think about this every day. I don’t have the answers, though. I just try to make as many postitive, incremental changes as I can. I hope we here is the US of A can overcome this brainwashing, because without shedding this false narrative, without leadership that can compels us to ‘Make the Earth Great Again’, we’re in for a world of hurt. It is brutal to see Sanders, a candidate that I think could be that leader, slowly slipping through our grasp. Everything about our current ‘ugly and murderous system’ is designed to prevent that kind of leadership from taking power. Not sure what to do about that. Burning fossil fuels isn’t a way of life. It’s a terrible mass extinction engine. We should be running in the opposite direction from that as fast as we can. It’s a similar situation to what we had with Obama. I don’t think Hillary completely gets climate change — which she should. But she’s likely to push positive policies on the issue — not fast enough for sure. That said, she’ll tend to protect certain fossil fuel interests that she sees as strategic — which is what got her into the whole fracking trouble in the first place. She is someone we can influence, though. And I think it’s possible that we could make a climate hawk out of her. As of now, she’s giving out conflicting signals and doesn’t yet seem to me to be serious enough about this threat. One more point and then I need to get back to writing blogs. The usual suspects are pulling every lever they can in an attempt to kill wind, solar, and EVs. If we let this happen, then we are done. No way out. Pretty much everyone then becomes a captive consumer to fossil fuels. One possible positive from an unprecedented Arctic ice retreat this summer could be that the issue is finally, indisputably front and center in the weeks leading up to the election. If Clinton can truly grasp the dire seriousness of this event and use the general election debates as a platform from which to educate the country, it could be pivotal. People will tune in to the debates big time to watch the mud slinging and I think the opportunity to bring folks up to speed is significant. – Good linkage on a serious issue. Wow. I just have to say thanks to Dahr for this. It’s a hell of an honor to be recognized by a leading journalist in the field. Warmest regards. Ps Dahr is located in the PNW in WA. Well, then he’s got a front row seat to some of climate change’s nastier effects — just like you, DT. Our predicament has one over-riding cause. The global dominance of the Right, most particularly in the Anglosphere and the global hegemon and bull-boy in chief, the USA, most damagingly. The denialism that has thwarted the actions that could easily have saved billions of lives, is centred in the West, the Anglosphere most markedly, and is 99% on the Right. The only way to saving some of humanity is by removing the Right from power, totally and forever, as we simultaneously grapple with a multitude of ecological disasters. And they, the assassins of humanity, will fight us every inch of the way. Well I got some good news about the Starfish on the USA NW and Canadian Pacific Coast: the starfish are reappearing! And on a different off-topic, the USA NE and Europe are fracking freezing! emsnews wordpress com (Warning: the author of the article denies AGW). Wasting syndrome, being a disease, would spare a number who had traits that allowed them to fight the illness off. They should pass these traits on to their off-spring. However, the warming waters that caused this situation in the first place will not go away. And as they grow warmer they will produce more pathogens and more dangers to the creatures that live in these waters. So, sadly, this is likely to be the first hit of many coming to living creatures within that region so long as we keep burning fossil fuels. “Murray has been researching the boreal forest for 25 years, and he and his colleagues have seen many changes firsthand. In British Columbia, 80 percent of the province’s mature lodgepole, another boreal species, have recently died from the mountain pine beetle, whose range and season both expanded greatly because of a warmer world. White and black spruce, the main trees species in the boreal, are also dying in vast numbers “The southwest Yukon looks dramatically different than it did 25 years ago when I did my master’s [degree],” he said. “Everywhere you go there is deadfall. “These disturbing signals of a forest in steep decline are why NASA just launched a large-scale research project called ABoVE — Arctic Boreal Vulnerability Experiment, a “major field campaign” with 21 field projects. The boreal forest is breaking apart. The question is what will replace it?’ says one scientist. FYI Griffin, there is this comment from Gail Zawacki. concentration of toxins in the atmosphere. They can’t move north fast enough. And there’s not really much north left to go. In a more gradual climate transition, they’d possibly populate Greenland and Antarctica. If this is to happen in the current situation, human beings will have to carry and nurture the seeds in a large-scale effort. Even so, the kinds of climate disruptions we’re setting up now really call into doubt whether the boreal forests can make it at all. They’re basically the corals of the land. And they’re in for a world of hurt. Warming absolutely has a big impact — at the very least due to rapidly increasing the amount of fuels available for wildfires. But also by providing invasives and expanding conditions northward where these trees are not adapted to live. In addition, the toxins that she mentions come from the same source as the warming — fossil fuels. In any case, there is a strong consensus that warming is the primary factor hitting these forests and Gail’s view, though taking in part of the picture, isn’t looking at the larger context of warming’s impacts. We wouldn’t have these fires without warming, for example. We wouldn’t have more frequent lightning. And we wouldn’t be activating the permafrost, and increasing fire intensity to the point that large fires now burn completely through the duff. We wouldn’t have peat-like permafrost thaw zones smoldering throughout the winter and providing another source for fires. We wouldn’t have such a pervasive northward extent of pine beetles and other invasives, and we wouldn’t have a huge section in the south and bounding north featuring temperatures in which these trees were not adapted to live. It’s important to keep in mind the correlation of urban and wildland tree die off — and global warming. Both are the result of the toxicity of the atmosphere. Generally speaking, climate and drought gets to the trees, and plants, through the roots and works upwards — whereas air pollution damages the foliage first. Heat exacerbates everything, and diminished foliage allows the sun to dry out the soil and understory plants and leaf litter which exposes all to wind and rain erosion. ” Toxins in the atmosphere”, whether Green House Gases, or Short Lived Climate Pollutants –they’re all connected. With humans and fossil fuels being the major umbilical. 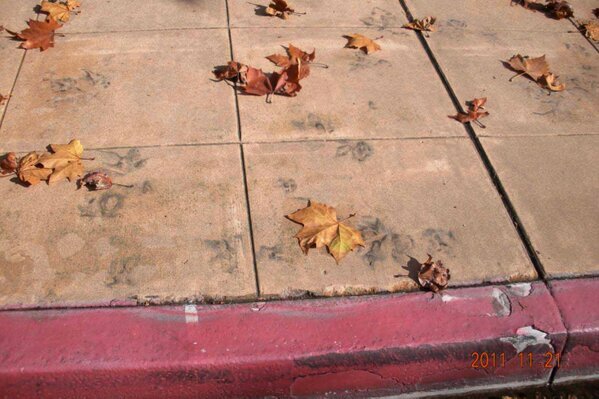 – Black carbon soot deposits can be seen as black leaf prints on a Santa Barbara, CA sidewalk. Thanks for the mention mlparrish. Gail has taught me a great deal, if only by pointing the direction in which to do my own research. Although she is quite capable of standing on her own, if I may raise a counter to the argument that she points to pollution as a greater impact of warming, let me say this. She does not dispute that man-made warming is a huge factor in tree health. Rather, there is a greater picture going on that points to more than just warming or beetles. Trees, like all plants, breathe the same air that we do. That the chemical composition of our air has changed, is quite indisputable. Her main point is there are compounds in the air, such as reactive nitrogen and ozone, that will weaken a tree over time. The tree thus weakened, is like an AIDS victim. Immune system compromised, they fall prey easily to pathogens or parasites that which they may have otherwise fought off. This is no different from the reasoning that links air pollution to premature human mortality, (of which there is plenty of discussion these days). She asks that we take a look at the details of the tree deaths. Although it can be argumentative to discuss why the beetles thrive now when the trees may have had defenses against them before, in other areas, warming and drought just don’t cut it as a catch-all explanation for mortality. A prime example is here in the Northeast USA. We have not (thankfully) suffered a long-term drought recently. Yet we have unmistakably suffered a vicious increase in tree mortality. There are dead and dying trees all around us now. 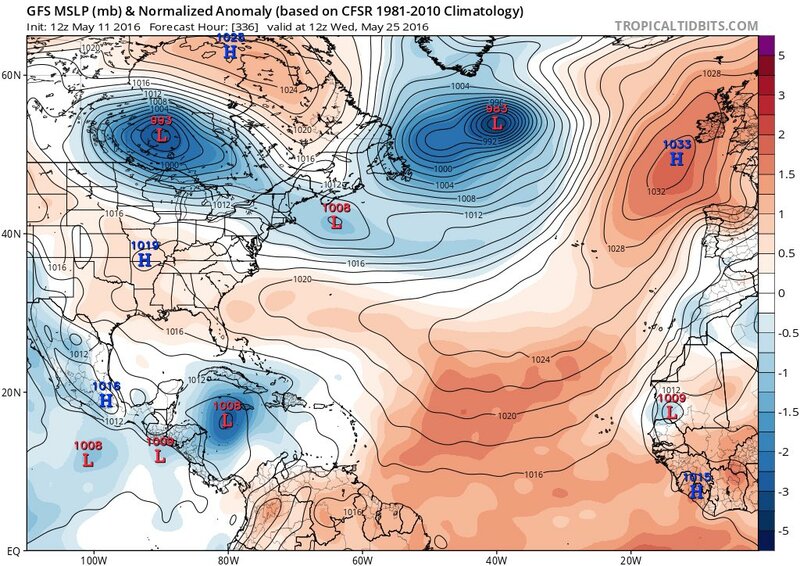 Our weather has not been ridiculously warm, we have had recent spells of extreme cold and warmth, but nothing that has been outside the realm of variability here in a region that typically experiences wild swings. Something is killing the trees of many different species, and long before they should be dying. When I did my own research, it became clear that the issue is one that has worldwide reach. Something is up and it is not always drought or beetles. Trees have survived some big-time droughts before, yet now they seem as fragile as garden flowers. I am not here to tell anyone that Gail has it right, but I would suggest that before dismissing her concern regarding our emissions having a direct impact on tree health, that one should spend some time among the links that she has provided on her blog. The mountain of evidence may surprise you. If the forests of the boreal regions are in anywhere near the shape that they are here in New England, then there is sufficient fuel available on the ground to turn what would be a typical fire, into a monster. I do happen to believe that there is more than just ambient temperatures and relative humidity that is creating these monsters. But I am not there and I am not an expert so I just don’t know. In short, I just want to mention that Gail considers air pollution not to be the only factor, but rather a complimentary one. Consider it another self-inflicted wound that is quickly bleeding away our ability to sustain our species upon this planet. If that’s the case, then it’s accurate. But your statement and the quoted statement don’t come to the same conclusion. 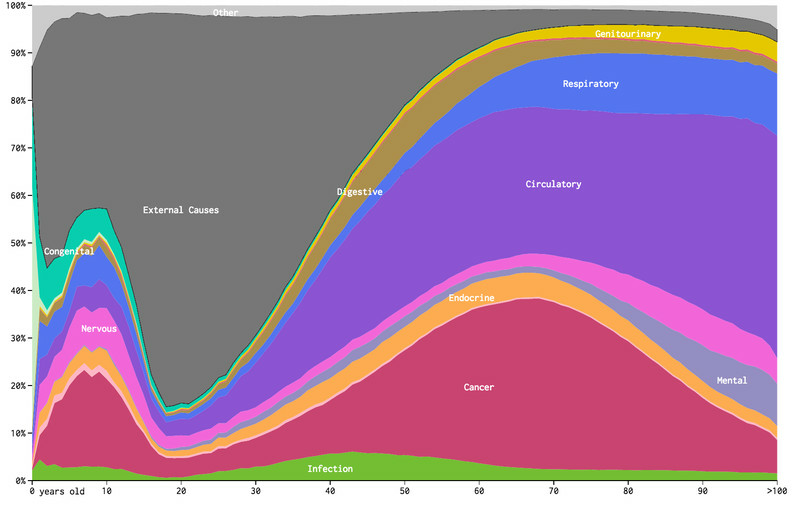 – USA – Health threats ending in mortality via a very colorful graph. Small particulate air pollution via Short-Lived Climate Pollutants has to be the main driver of respiratory (COPD) ailments. American mortality from air pollution may have decreased over the years but COPD/asthma has to be at ‘epidemic’ levels. 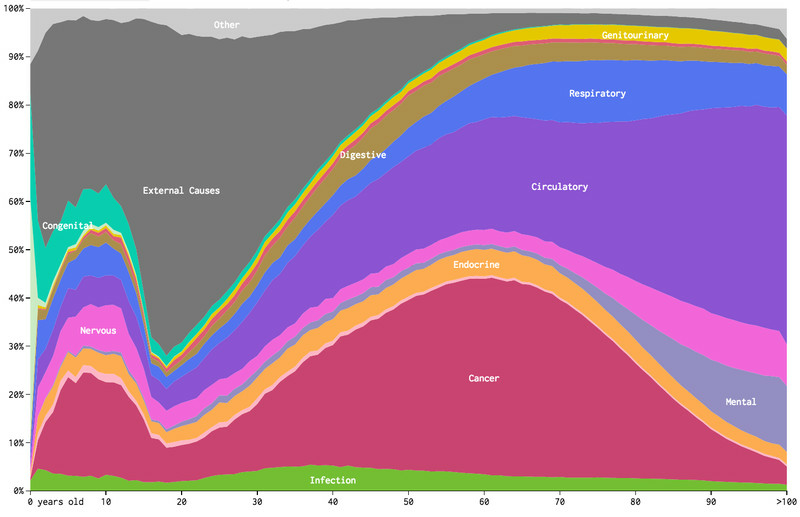 Using mortality information from the US Centers for Disease Control and Prevention from 2005 to 2014, Nathan Yau at Flowing Data made an interactive to map out death trends for men and women from the age of 0 to 100. The chart shows percentages — not absolute counts — for the 20 categories of disease deaths the CDC tracks, as well as deaths from external causes. What’s most revealing is how much the risks change as we age. As you can see, the risk of death from chronic diseases like cancer, circulatory causes (i.e., heart disease), and respiratory issues (for example, chronic obstructive pulmonary disease) starts to rise at about age 20 and keep climbing. Meanwhile, the risk of death from “external causes” (like traffic accidents) starts to shrink at about 20. Ps Small particulate air pollution and ozone worsens circulatory problems. And often coupled with respiratory ailments. Regarding the starfish population explosion on the west coast, and crab population explosion in the Chesapeake Bay I have a concern. It is a bit too much, too quick to be a genetic adjustment. That is not possible to generate such a population of successful mutations in such a volume in so short of a time in so few generations (or a single generation). This actually may be due to a loss of predators who normally thin the number of larvae. A common trait between both population explosions (East & West coast) is that both starfish and crabs have a larval stage. Specifically fish and jelly fish feed on both crab and starfish larvae. This good news may actually be bad news, a loss of fish. Naomi Klein reminds me of Robert…they both face up squarely to the crises ahead of us, yet also see possibilities if we don’t give up and can beat back the forces stacked up against us. I highly recommend any of her books. By all indications as seen recently, I’ll contend these recent calamities are the beginning of a new wave of anomalies never experienced by mankind. We will have new vectors of diseases, the insects, now seen in parts further north than certain species had ever inhabited before. We may get a whole rash of new diseases never seen before as rain forests are destroyed, then imported northward. What alarms me the most is the thawing permafrost and what may be unleashed by even slight temperature excursions. The sources I’ve read didn’t know how to figure these hydrates and clathrates? into the overall picture of climate change. Glaciers are drying up, melting faster every year which will leave large swathes of humans without means to grow food. To address this global warming crisis in a meaningful way will require an entire reworking of global economic systems, a paradigm shift of unprecedented magnitude if our species is to survive. I have no answers to this problem, and wish I did, but the science has been there all along since the first Earth Day in 1970 and nothing much meaningful has happened in 45+ years. But until leaders take drastic steps I’ll wish everyone with children to first and foremost take care of your family they’re what matters. Keep pressing, there still might be a way out of this mess. This crisis is best described as a hyperobject, there but not, temporal, non-local, viscous, and totally life threatening. We require an end to fossil fuel burning. That is the alpha and the omega of this crisis. “Despite the urgency to cut greenhouse gas emissions as climate change bears down on the globe, fossil fuel use is not likely to change much in the coming decades. Though renewable energy will grow quickly though 2040, gasoline and diesel will still move most of the world’s vehicles, and coal will still be the largest single source of carbon emissions. Anyone have a clue what’s going on with trees? I used to collect fungi from the side of birches in my youth and they were hard to come by, as they only took on trees with physical injuries. Now they are much more common which means quite a big fraction of birches (maybe one in 30 or so) is rotting while standing before the tree even hits it prime. Nowadays there isn’t clear injuries on them either which would function as an entry way for the infection. – One thing to consider. Trees could be made vulnerable via nutrient rich airborne nitrogen. N from fossil fuel use is abundant everywhere these days. Don’t know about any part spores blowing in the wind may play. The street acts like a breezeway which brings in aerosol pollutants and caused the side of the canopy to fall off/die off first and most completely. This side also faces the major nearby traffic corridor (not pictured). At this time, many of those bare branches have not re-foliated but are covered with a thick epiphytic crust. Using the oldest fossil micrometeorites — space dust — ever found, new research has made a surprising discovery about the chemistry of Earth’s atmosphere 2.7 billion years ago. The May 11, 1934 edition The Daily Oklahoman gave little indication of the plague that was to come. A small item on the front page story about the state’s wheat harvest being below normal. Another mentioned a storm that dumped an inch of rain in western Oklahoma that might alleviate the dust in the air. A November 1933 in the Dakotas provided what would be the preview of the years ahead. Just six months later, May 9, 1934 a dust storm kicked up. It would last two days and when it was over it had swept more than 12 million pounds of dust eastward, as far as Washington DC. This was the end of the beginning for what would become the Dust Bowl. I read a book about the Dust Bowl a couple years ago. It was pretty good. The title is The Worst Hard Time, by Timothy Egan, if anybody’s interested. It has parallels to our climate crisis, as the disaster was partly a man made event, since thousands of farms had cleared the native grasses in order to plant wheat, but the stock market crash changed the demand and fields sat empty, just waiting for the right conditions to strip away the to soil that had been slowly accumulating over eons. In the following years things became so desperate that it was literally a struggle just to stay alive. On the PBS Newshour tonight they announced that Miles O’Brien would be expanding his science reporting there , they solicited ideas from the public on what stories to do. I for one know what I intend to suggest. 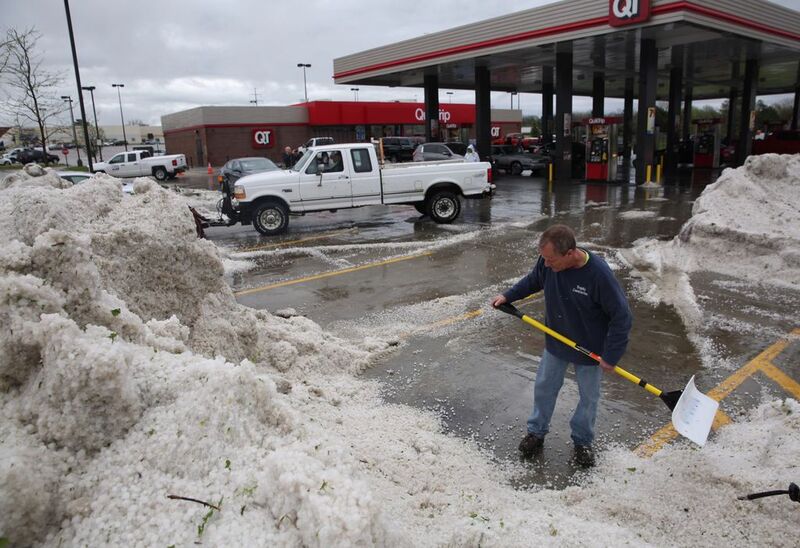 I have long thought that hail is an excellent metric for measuring climate change for several reason’s. 1 – It is the single largest insurance payout in the US, year in and year out, so those folks have detailed records. 2 – As the system gains energy the formation of water droplets will be bounced back up more often A water droplet, just can’t fall to Earth any more , it will be hurled back upward to be frozen again and again. 3 – If number 2 is true, the number of events where we see “baseball” hail will increase. 4 – If number 2 is true, hail will appear where it was rarely seen before. I’m going for this from now on . Nobody knows what Anthropomorphic means. As a life long student of history, my growing out rage over were we are headed, made me think of “Blue Duck” . And the heart of the world we all live in. We still live in such a world . So please , dump these folks that think we can have “Fun, Fun”, and drive our Corvettes as fast as we want. This looks like a much bigger area than the Fort McMurray fires last week, and the intensity of the carbon monoxide seems higher. Fort McMurray had CO concentrations of maybe 5000 ppb, according to this same site. Carbon dioxide concentrations from earth.nullschool above 500 ppm along the Siberia/ Northern China border, in the area of the fires today. Some images detailing the destruction of the Great Barrier Reef. Heartbreaking. CSP would be the way to go. Maybe as part of a Sahara Forest Project expansion. The Qataris and the Tunisians already have the saltwater greenhouses working effectively. But I’d think getting some of the far too salty water out of the Arabian Gulf, Red Sea waters and converting the salts into building bricks or whatever would be just as good an environmental objective as Sahara Forests. Wow, big carbon monoxide plume in Siberia today – in an area hidden from the fires and thermal anomalies NASA data product by cloud cover. There must be major wildfires going on underneath the cloud cover, I think. This link will update as time goes on, it is set to current conditions so the image will automatically update.